Mark Ellis is well known in New England power and sail circles for his efficiently propelled and neoclassical designs. Born 69 years ago in Watertown, N.Y., he worked early in his career for noted yacht designers Ray Hunt, Ted Hood and Phil Rhodes. Ellis’ designs also reflect the aesthetic and practical influence Olin Stephens had on his thinking about boats. He ended up working for C&C in Ontario for 34 years but in the last few years moved back to the States, having recently settled in that center of all things yachting, Essex, Conn.
His apprenticeships with these somewhat introverted, accomplished men of great talent taught him many things, including the value of a well-trained eye and, just as important, the ability to imagine and roll over in his mind three-dimensional shapes. Because of his ability to think and visualize three-dimensionally, he still draws boats on paper and then scans the images into a 3-D CAD program for further development. It was interesting to talk with Ellis about how he uses details such as varying radii in the trunk cabin camber to please the eye (partially by deceiving it), to make it flow as of a piece with the hull and pilothouse, to disguise height, to exaggerate length. After all, the smaller the boat is, the harder it is to make it pretty when you are trying to fit stand-up accommodations inside. 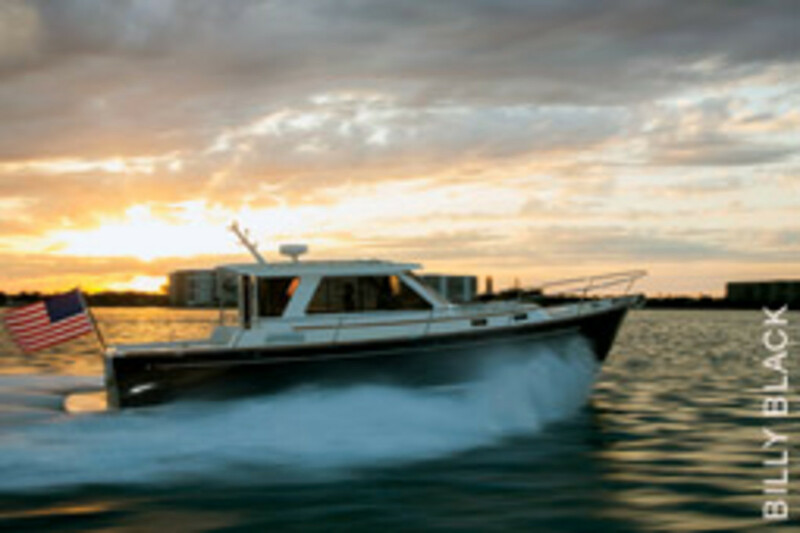 Take the Abaco 40, which Ellis designed for Canadian builder Bruckmann Yachts. 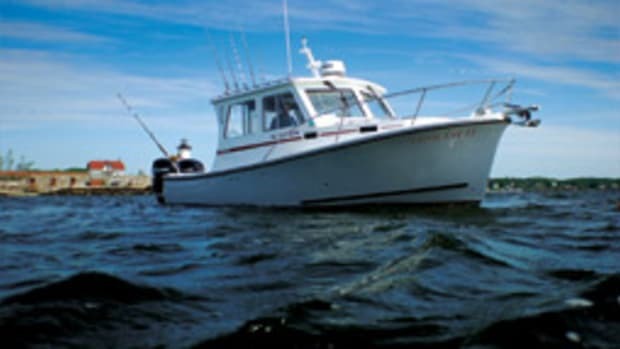 The center third or so of the top of its trunk cabin is of a constant radius, but this changes as you follow the deck surface farther outboard, with the curvature tightening to produce a more tightly radiused surface at the deck-edge lip. The lip itself is inset and trimmed with varnished wood to break up the trunk top and sides. The same effect continues below, along the sides and front of the trunk cabin. The inboard vertical slope of the deckhouse and trunk cabin increase as you come forward, with the most extreme rake seen across the forward end. So when both slope and radius change continually, the eye is pleased without really knowing why; it just gets a happy buzz from the spectacle, seeing seamlessness everywhere. 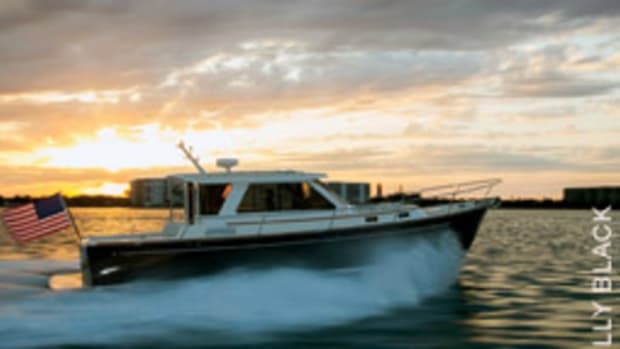 Although nearly every boat looks better viewed from the bow or beam, the visual contact between the Abaco 40’s bow and stern is more pronounced, largely because the bow is so pretty. The stern is strictly businesslike and, in my view, not as appealing, with high freeboard and little tumblehome aft combining with a boxy transom. On the other hand, some builders take tumblehome and transom rake to extremes, eating into already limited cockpit space. Ellis has given a lot of thought to his creative process. “The effect of CAD programs is two-edged,” he says. “It gives you the opportunity to make changes easily — you can do a thousand iterations in a few minutes. But it also limits your thinking in some ways because you are dealing with shapes in a program. People are more open in their thinking if they hand-draw; they have to use their heads more when drawing things out manually. You use your intuitive sense a lot more and store information in your brain rather than in a machine. It’s like kids Googling information they need rather than really learning by rote. We spent some time discussing Ellis’ hull form, which includes moderate deadrise forward transitioning to very wide chine flats, low-deadrise sections and a full keel aft. His observation of conventional deep-vee bottoms is that they are fine as high-speed hulls but don’t do so well at semiplaning (semidisplacement) speeds. Ellis also thinks most people cruise below 20 knots, so why not optimize the hull for those speeds, including widening the chine flats in a long wedge (as seen in plan view) as you move aft along the hull from the typical 3 to 5 inches to several feet. This is precisely what he did with the Legacy designs, which have essentially the same deadrise distribution from bow to stern as the Abaco 40 but have a greater beam/length at the waterline, as mentioned previously. 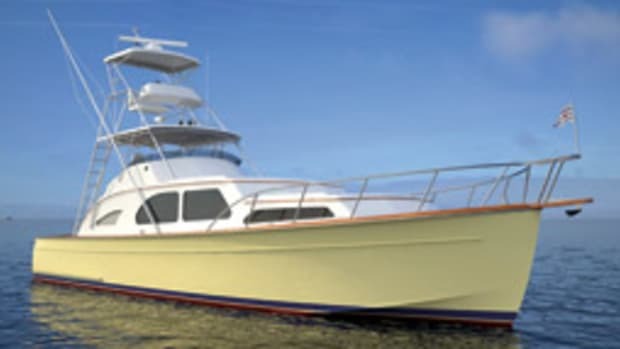 The Abaco 40’s transom is made up of flat sections in the outer thirds of the hull (the chine flats) and another flat section on the centerline. This shape accounts for the boat’s easy transition to plane at low speed, as does the extension of the hull buttocks below the swim platform, which decreases bottom loading by spreading the buoyancy over a larger area aft while adding planing surface. Such an underbody aft does not bode well for course-keeping when running down-sea, as flat sections have no resistance to lateral movement, so it needs the keel for this reason alone. On our brief Connecticut River test ride, the boat ran a little too bow-down when unassisted by the tabs, which would not bode well down-sea. The boat’s full keel will help compensate in this regard, but it also ends well forward of the running surface. A keel also adds a lot of drag that increases with speed, and it keeps the boat from heeling into a turn. So the centrifugal force in a high-speed turn will be felt in an outward direction by passengers rather than more comfortably down through their feet. On the plus side, the keel will help keep the boat from blowing around in a crosswind, and it extends below the running gear, essentially offering grounding protection for the prop and rudder. The Abaco 40 draws 3 feet, 11 inches with the full keel and no prop pocket, compared with the heavier and similar-size Back Cove 37 at 2 feet, 8 inches. Fifteen inches is a lot of extra draft to consider when cruising coves and backwaters, but, of course, the Back Cove’s running gear is exposed. My guess is the keel takes 2 to 3 knots off the Bruckmann’s top end and 1 to 2 knots off in the sub-20-knot semiplaning range. 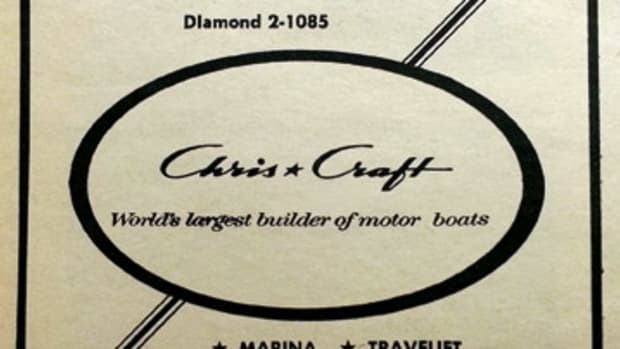 There seem to be several broad-brush approaches to boat design. One is to start with the hull, giving the highest priority to seakeeping qualities. Another is to start with internal volume requirements, so the accommodations are more generous for a given LOA. However, these are not boats I would want to be aboard making way in a blow offshore. Ellis’ Abaco design, however, strives for seakeeping over internal volume, but its hybrid shape and keel make it both uniquely capable and limited as to seakeeping. I have run similar Ellis designs, such as the Legacy series, which are constrained by their seakeeping ability to semiplaning speeds in a moderate seaway. At slower speeds, the hull rises out of the water only a little, so the sharper forefoot is down in the water to comfortably meet the waves. When the boat rises vertically as it comes up fully on plane at higher speeds, most wave impact occurs at stations 3 to 5, where those flatter hull sections and big chine flats will make you throttle down to let the forefoot engage the waves again. Ellis’ design priorities include good access to storage, wide side decks to allow safe access forward and clear helm visibility. The 40 is highly successful on all these counts. It’s a step up and through a pair of sliding doors to the pilothouse, or saloon if you wish. (The doors are nice, but the frame is a potential head-banger at 72.5 inches.) The layout is simple and functional, with fore and aft settees to port and starboard, an adjustable-height table offset to port, and pilot and copilot pedestal seats forward. Builder Mark Bruckmann’s artistry is fully on display, with finely crafted joinery, a teak-and-holly sole and a mahogany helm station setting off the white backdrop to pleasing effect. 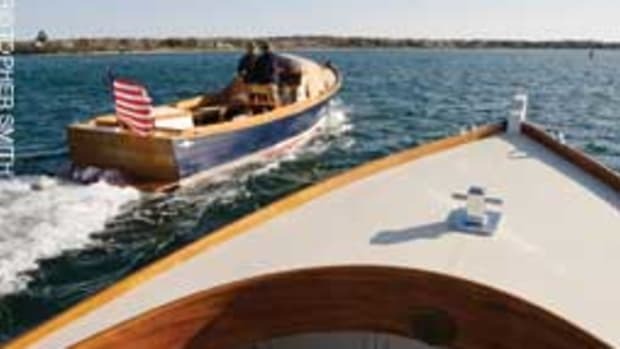 The boat is beautifully finished in Herreshoff style. “Mark Bruckmann is the detailer, working out the sizes, radiuses and other effects that make it flow and look continuous,” Ellis says. Sliding side windows forward and a pair of overhead hatches let in fresh air. Here’s another neat touch: The aft corners of the pilothouse are curved Lexan windows that open up visibility aft from the wheel. Visibility all around from the helm is excellent, in fact. Forward, the saloon communicates freely with the galley below, with an open dash under the windshield and a finely crafted cabinet with a varnished top that will handily double as a chart table, with storage inside. To starboard is a Hinckley-esque helm, exquisitely wrought of varnished teak. Though beautifully done, I would rework a few things ergonomically. I prefer a tilted automotive-style steering wheel rather than the vertical wheel on this boat, which is harder to reach from the seat and awkward to turn while seated or standing. Also, the engine instruments are flat-mounted just forward of the wheel, which makes them impossible to read when seated without leaning way forward; they should be angled and positioned for clear reading. The angled and raised GPS/radar display works well as is, as does the compass position up high, immediately below the horizon as viewed from the helm seat. 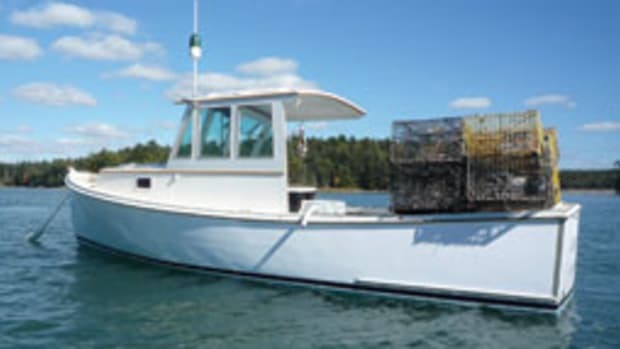 A big saloon deck hatch with power lift leads to the Cummins diesel, and part of the appeal of this boat for some people will be its single-engine power. Combined with thrusters, the boat will be as maneuverable as one could hope for. And having one rather than two diesels leaves plenty of elbow room below. With the fixed settees narrowing the available room for the hatch, you climb down abaft the engine, above the shaft, and work your way forward from there. Or raise the cabin stairs, and it’s a clear — albeit narrow — shot into the forward end of the engine room. Systems are neatly laid out and labeled, and wiring and plumbing runs are out of harm’s way, although I’d like to see a cableway or looming as added protection for the big wiring bundle forward of the engine. The hull structure is in plain view in the engine room, of course, and it’s both ruggedly built and cleanly finished. 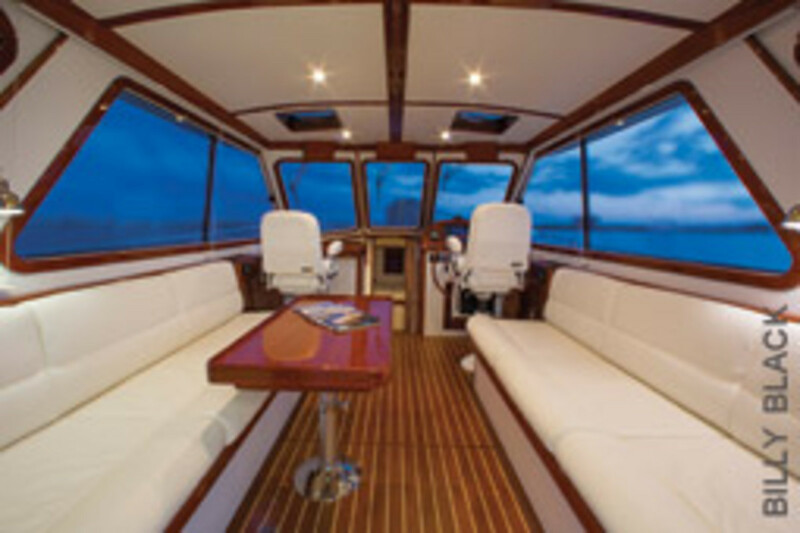 You’ll be as ready to show off the engine room as the saloon on this boat. 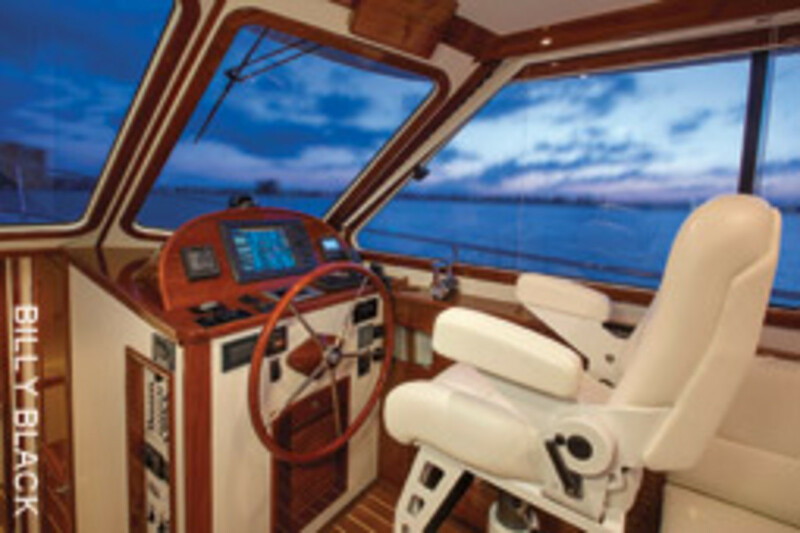 Four companionway steps take you to the cabin, with the galley immediately to port. It has a conventional U-shape, practical in every detail, and to my eye it seems sailboat-inspired (a good thing). There’s a fridge/freezer, cooktop, double-deep sink, microwave and plenty of storage. Lots of light floods down from the windshield above, helping to keep the chef in good spirits. Opposite to starboard is the head, with a VacuFlush MSD, a long countertop, another large sink (with sensible spill-resistant vertical walls) an opening port light, and an enclosed shower with a teak seat and an adjustable shower wand. Also at the companionway is the main electrical panel, with its ship-like quality of ergonomic accessibility and logical layout: DC at the top, genset in the middle and AC at the bottom. There’s no need for ship/shore power interlocks, thanks to a simple selector switch for shore forward, generator, inverter or shore aft. The hull and deck are open-molded using conventional female tooling, which gives Bruckmann the possibility of building three 40-footers a year with its eight employees. The hull starts with gelcoat, followed by mat and non-woven roving. 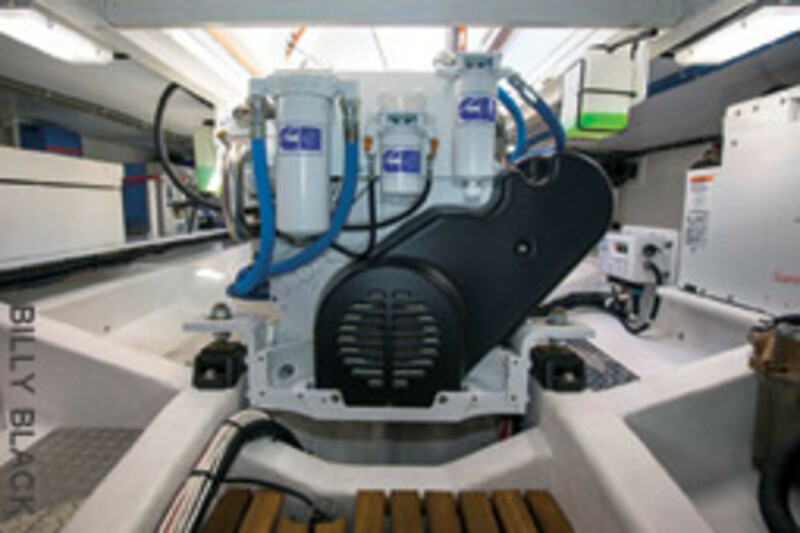 Core-Cell foam in the hull sides and bottom is vacuum-bagged against the outer skin, which helps ensure a high-integrity skin-to-core bond. More layers of fiberglass follow on the inside of the core. Fiberglass is laid up over foam cores to create the stringers, and the bulkheads are plywood-tabbed in place. The hull-to-deck joint is fixed with Plexus and bolted. The result is a strong structure, with the foam core adding stiffness at less weight while adding acoustic and thermal insulation. Our test ride took place in calm water on the Connecticut River out of the Brewer Dauntless Marina in Essex. I would have preferred to run offshore, but the wind was calm, so I wouldn’t have learned a lot that I couldn’t figure out on the river. One result of the big chine flats and flat hull sections aft is that the boat slides up on plane like a pontoon, with very little bow rise and a clean wake astern at 11 knots without tabs. (The tabs are too far inboard to affect heel much, although they would drop the bow when used in concert). Even at 9 knots, there was no hump, just a gradual increase in speed as the hull accelerated. And at 8 knots, the wake directly astern was solid and foam-free — a first for me. In a 2,100-rpm, full-rudder turn, the boat turned flat — the result of the keel, which cancels the natural tendency of the rudder to heel the boat over. But neither did the hull heel outboard like a round-bilge lobster boat can, so the effect is not as disconcerting as it might be. Steering took five turns from lock to lock, which is two turns too many for me but typical of a boat of this type. Time-to-turn 360 degrees was 27 seconds to starboard and 25 seconds to port, the difference likely attributable to the right-hand prop cooperating more by walking to the right when running ahead, tightening up a turn to the left. With the flat running attitude, high helm seat and big windows, you couldn’t ask for a better all-around view. Situational awareness goes up with improved visibility, so the boat will be inherently safer. The boat handled very well around the dock. Just put the rudder amidships and use the thrusters for precision maneuvering. Even with a relatively small 24-inch prop, the drivetrain had adequate traction when shifting at idle speed. With its 670-hp Cummins, the Bruckmann is capable of 28 knots and can cruise as high as 24 or 25 knots in optimum conditions. The hull’s sweet spot in terms of efficiency and performance is in the 10- to 18-knot range, so I might be inclined to put a 450- or 500-hp diesel in the boat, which is all it would take to cruise at those speeds, saving money, fuel, weight and space. 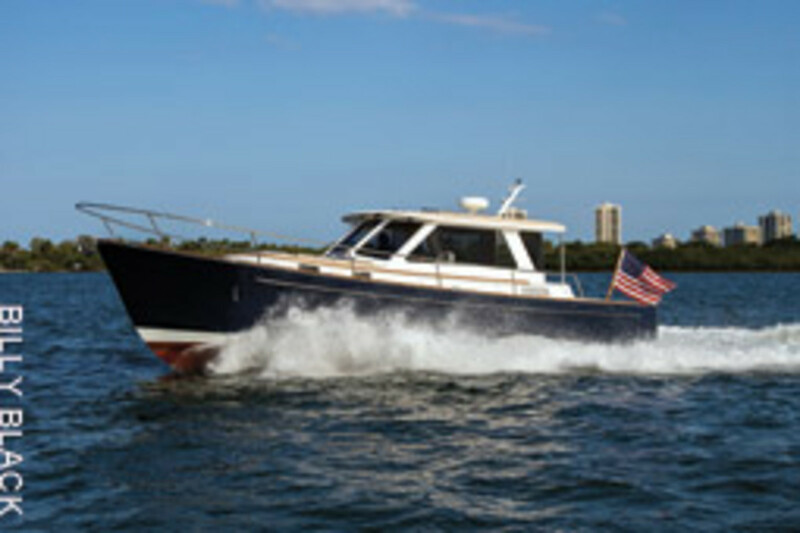 The Bruckmann 40 is a very well built, beautifully finished, attractive New England-style sedan cruiser. 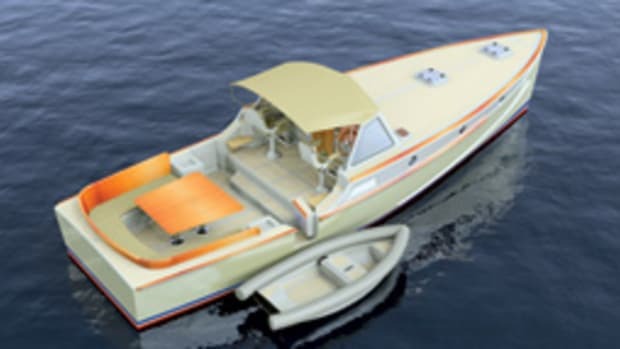 It’s the product of a thinker and a seaman with extensive experience designing a range of racing and cruising power- and sailboats. 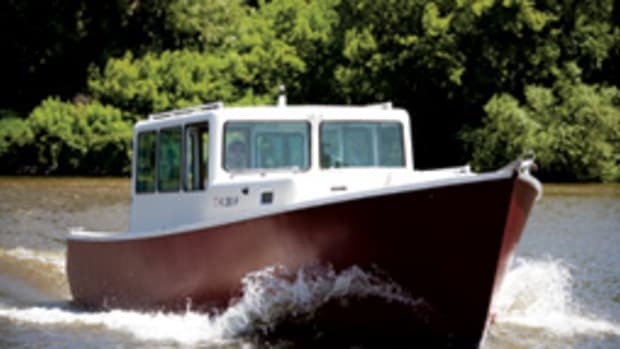 The single diesel makes the boat comparatively economical to operate, and the thrusters give it pinpoint controllability around the dock.